The campsite Les Verguettes is located 5 minutes by walk from the center of the village, where shops and restaurants offer their services. 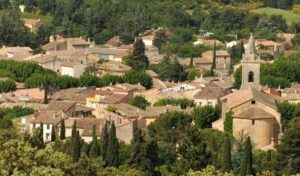 This typical Provencal village is characterized by its rounded construction, housing a central square where you find the petanque players and locals people quietly discussing under the plane trees. The market offers its specialties every Wednesday morning. Formerly a hotspot for the exploitation of ocher, you can admire the old mansions in the colors of the region. Nestled in farmland and mountains and forests, you will have plenty of time to taste the fruits and wines of the region and discover nature at the turn of your walks. In this old building in the village you can enjoy the local cuisine based on the skills and knowledge of the chef. Julie and Emmanuel welcome you to their convivial restaurant with their special dishes. The olive grove patio under the olive-trees with its special atmosphere. Enjoy a quick meal during opening hours. This is an old Provençal farmhouse in the middle of the vineyards. Tally awhile there and enjoy the exquisite cuisine of the Provence, gazing at the panoramic view of the Mont Ventoux. A french typical restaurant to savour in their intimate inner courtyard! A real spanish restaurant where you can discover tapas and other spanish meals. With a great view of Mont Ventoux, savour good meat, specialities and home-made French fries! Bakery, Pastry making founded in 1830, gives you quality, taste and puts you in a good mood! At the traditional grocery store, you will find the delights of the area: fruit and vegetables, as well as various specialities and artisan pork-butcher products.